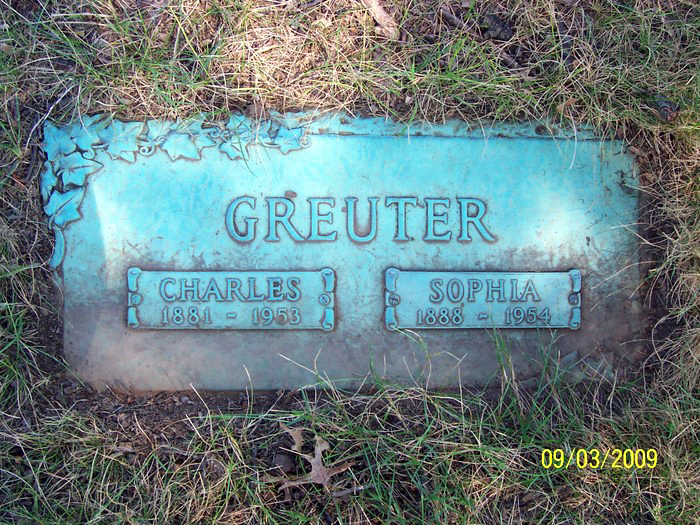 Charles: Son of Felix Greuter Sr. & Margaret Surbeck - Brother of Felix Greuter Jr., Margaret Greuter (Frank Bauer), Herman Greuter (Christina Kritzmacher), Annie Greuter (Otto Bevensee), Mary Greuter (Frederick Kluge), Franklin Henry/Henry Franklin Greuter (Hilda Roth) - Husband of Sophie Rittershofer - Father of Ruth Anna Greuter (? Devine), Felix Julius Greuter, Charles Greuter (Margaret Studdle), Dorothy Greuter (Michael Bertelo), Robert Clarence Greuter (Eleanor F. Morris). Sophie: Daughter of Carl & Hattie Rittershofer - Sister of Mary (August Friewald), Eddie, William, Clara (? Kastner), Elizabeth (? Booth), Robert, Annie - Wife of Charles Greuter - Mother of Ruth Anna Greuter (? Devine), Felix Julius Greuter, Charles Greuter (Margaret Studdle), Dorothy Greuter (Michael Bertelo), Robert Clarence Greuter (Eleanor F. Morris). Charles and Sophie each died on Christmas day, exactly one year apart; Charles in 1953 and Sophie in 1954.